The concept of ‘local’ has become aspirational, a lifestyle choice, peddling the idea that to buy and eat locally in itself somehow makes you a better, more ethically aware consumer. Whilst I’m not on board with the idea that local = morally good, I do think we could all do a little more to support local producers where we can, and reap the benefits. But what do we really mean by ‘local’? Is it food grown with in a 20-mile radius of where we live? 50 miles? 100 miles? Or in our global economy could we justifiably call any UK-grown produce ‘local’? If you live in Manchester and buy tomatoes grown on the Isle of Wight, it is infinitely preferable to the food miles traveled by the tonnes of tomatoes we import from Spain. And we can’t blame the supermarkets for constantly pushing produce grown thousands of miles away; the huge tonnage of food that we import from around the world is driven by our demand – we want juicy tomatoes and strawberries all year round and at a spectacularly low price, so supermarkets must provide them or risk us going elsewhere. But what if they stopped providing them? If tomorrow every supermarket stopped importing fresh produce from abroad would we all die of starvation? Or would we simply adjust our culinary efforts to take advantage of what is available to us on our own green and pleasant land? We would quickly learn to eat not only seasonally but also, by default, locally. In reality it is we, the consumers, who have the power. If we stopped buying then supermarkets would simply stop stocking. So buying locally – and sustainably – is not a pipe dream, it is merely something we have to consciously choose. We have the power to change our own supply of food, once we realise that we can grow more of what we need in our own back yard. Indeed there is no intrinsic moral good in buying locally – it doesn’t make you a better person, no matter what the food trends tell you. Buying locally won’t feed the world’s hungry and it isn’t always the most sustainable choice. However, it does encourage us to give a little more thought to and maybe spend a few more pennies on our food, which in turn can help growers & farmers to invest in better methods that can make their produce more sustainable. And in the meantime it feeds the community that you live and work in, providing jobs for local people who spend their money locally and in turn support your local economy; it supports businesses that supply and buy from other local businesses; it invests in local producers, who employ local people and conserve our environment. And as an added bonus you can give yourself a pat on the back for helping the planet too – lessening the environmental damage caused by transporting produce from distant climes. 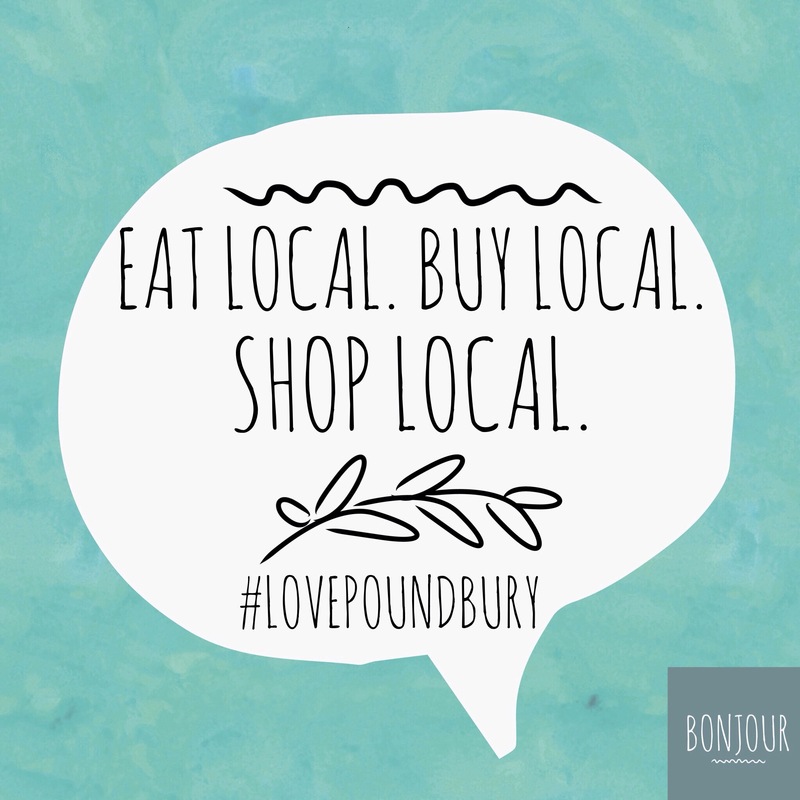 The principle of local extends to everything we buy; we are lucky to have a fabulous range of independent businesses right on our doorstep, providing everything from food, to toys, wedding dresses, legal advice, clothes, wine, and on and on. You can buy everything you’ll ever need right here in Dorset! It just requires a little more thought than merely logging on to your computer and surfing the online jungle for the cheapest price. Now I’m not suggesting you go mad and insist on buying exclusively UK-grown produce; it isn’t realistic or sustainable for the majority of people. BUT that doesn’t mean we can’t all do our bit. If we all just try to buy a few things locally where possible, it would make a huge difference; after all, do we really need to eat under-ripe, flavourless strawberries from abroad when we could experience the fleeting but unsurpassed deliciousness of a British strawberry, made all the sweeter for only being available several months of the year? And you know in your heart of hearts that nothing beats the sun-ripened, perfectly red, burst of juiciness that is a tomato grown on home soil. Who are the crazy people eating salads during the winter anyway? Tinned tomatoes are all you need to get you through the cold months, facilitating the most comforting of comfort foods in the likes of spaghetti bolognese or a good old casserole. So let’s all try to do a bit more for our local community – make a start by simply checking where your food has come from; if your courgettes have traveled farther than you this year then it’s safe to say they’ve done too many miles! So try growing your own or wait until your friendly local farmer brings theirs to your local market. And when you need to buy something, find out whether you can get it in your own local area; you’ll be surprised at the quality and range of products available to you on your doorstep. You’ll feel better for it! Buying local won’t necessarily make you good, but it definitely does do good. Leakers Bakery, Bridport. This artisan bakery has been creating delicious breads, cakes and savouries at their shop in Bridport for over a hundred years. And you can buy online! They provide all of the sourdough bread used on our cafe menu. Find them at 29 East Street, Bridport or at leakersbakery.co.uk . Brace of Butchers, Poundbury. Specialist butchers Rob, Ben & Owen source directly from local farmers and growers, ensuring that they provide their customers with the best quality produce. They are always on hand to give tips and advice, which comes in handy when I want to put something new on the menu! Find them at Kingspoint House, 5 Queen Mother Square or at braceofbutchers.co.uk . The Watercress Company. Based near Dorchester, providing the finest quality watercress and baby leaf. We use their delicious baby leaf mix in many of our dishes at the cafe. Find them at thewatercresscompany.co.uk . The Roast & Post Coffee Company. Based in Bristol, they offer great coffee and great service – coffee is roasted, ground and dispatched on the same day. Our regular customers love our coffee! Find them at roastandpost.com . Poundbury farmer’s Market is held on the first Saturday of every month in Queen Mother Square, Poundbury.